Thirteen time Grand Prix winner and Red Bull ambassador, David Coulthard has taken a promotional hot lap of the streets of New Jersey and the western part of New York in last year’s world championship winning Red Bull RB7 Formula One car. A Grand Prix at the Port Imperial Circuit is set to be added to the F1 calendar in 2014; the 5.1km circuit taking in the Hudson River waterfront and long straights through residential areas. Coulthard let the Formula One missile fly as stunned observers grabbed what is likely the first of many times they’ll see Grand Prix cars blast through their neighbourhood. A highlight of the run, was a raucous dash through the famous Lincoln Tunnel, that lies under the Hudson River, connecting New Jersey with Manhattan. Pity it won’t be part of the track layout as the scream of the RB7’s 2.4-litre V8 bouncing off the tiled walls is sensational. 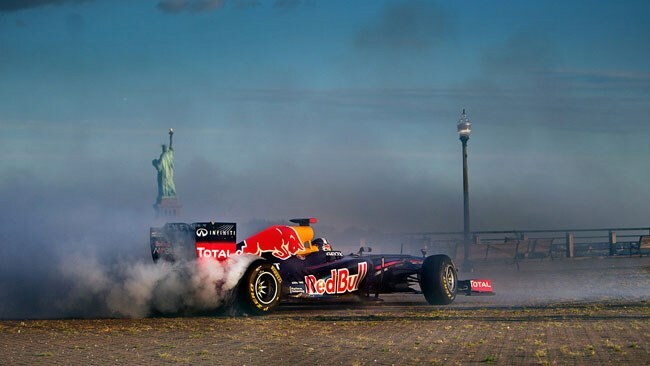 Does Lady Liberty approve of F1 burnouts?